Rural areas are an important component of the national economy and perform the following functions: efficient and competitive production; rational saving and protection of natural resources; assistance to rural population expanded reproduction; insurance of employment, proper level and quality of life as well as the revival of historical and the formation of new cultural traditions. 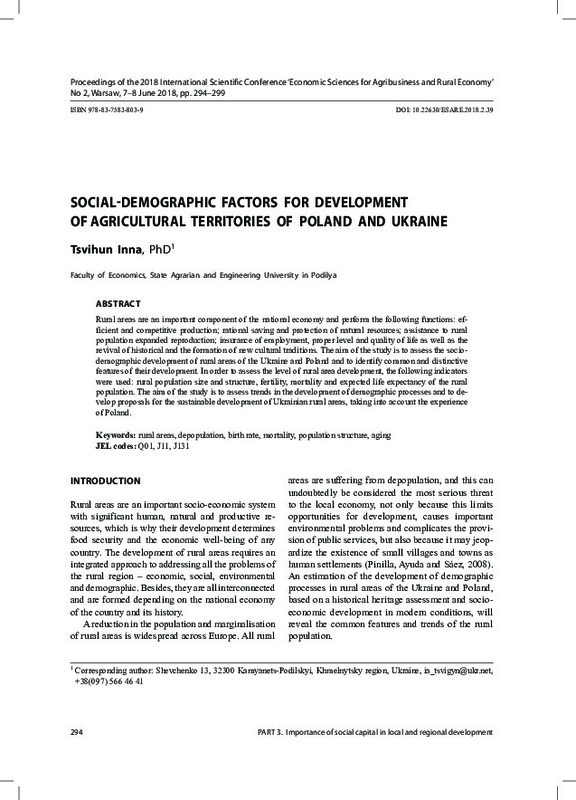 The aim of the study is to assess the sociodemographic development of rural areas of the Ukraine and Poland and to identify common and distinctive features of their development. In order to assess the level of rural area development, the following indicators were used: rural population size and structure, fertility, mortality and expected life expectancy of the rural population. The aim of the study is to assess trends in the development of demographic processes and to develop proposals for the sustainable development of Ukrainian rural areas, taking into account the experience of Poland.